Kakadu National Park might not be as popular as Uluru or the Great Barrier Reef. However, we feel that the park deserves more recognition and should be on the list of any Australia travel plans. Indeed, one of the largest national parks, Kakadu National Park Australia features fantastic landscape, unique wildlife, and Aboriginal rock paintings dated by to the prehistory. No wonder that Kakadu is listed not only one but two UNESCO World Heritage Sites: one for its natural environment, and two for its cultural importance. Where is Kakadu National Park? The Kakadu National Park Location is located within the Alligator Rivers region in the Northern Territory, about 170 km southeast from Darwin. The name Kakadu is thought to originate from the word Gaagudju, as the park is called by the Aborigines who have lived in the region from 20 to 40,000 years ago. Their presence can be seen in the round 5,000 rock art sites spread across Kakadu. The most accessible and stunning ones are Nourlangie, Nanguluwur, and Ubirr. You can visit Kakadu either as an independent traveler renting a car for the trip or go on an organized tour from Darwin. If you arrive late from Darwin, you can stay at the Aurora Kakadu Lodge close to the park entrance. Take a flightseeing tour to observe the falls from high above. Overnight at one of the Yellow Water campsites (Mardugal Camp, or Gagudju Lodge Cooinda). Or treat yourself at the Cooinda Lodge Kakadu. Many Kakadu tours from Darwin will be multi-day trips, or at least with one overnight in the park. There are 6 major areas around Kakadu National Park: Jabiru, South Alligator, Yellow Water, Nourlangie, Jim Jim, and Mary River. Ubirr: One of the must-see locations in Kakadu, Ubirr features some of the best rock art in the world. Make sure to take your time to admire the amazing paintings that are on display on the different rocks. From the lookout, admire the floodplains and woodlands, the green and lush vegetations contrasting against the red and yellow of the rocks. Wilkins rock wallabies can be spotted jumping around and hiding among the rocks and plants. Nourlangie (Burrungkuy): The oldest rock art in the world lays in the Nourlangie and one the UNESCO World Heritage Site. Another must-see while in Kakadu. The views from the lookout stretch into the impressive Arnhem Land Plateau. Here you’ll find some of the world’s oldest and most impressive rock art, and spectacular views of the Arnhem Land escarpment. Maguk Falls: access via the Maguk Walk, an hour’s drive south of Cooinda. 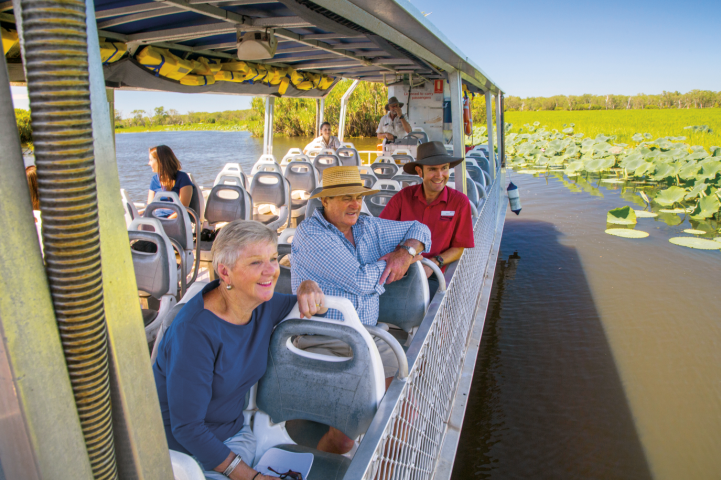 Yellow Water Cruises: catch one of the several boats that cruise the Yellow Water Billabong and tributaries of the South Alligator River from sunrise to sunset. Cruises last either 90 or 120 minutes and run all year round. Yellow Water Birdwatching and Wildlife: The cruises are the best way to watch jabirus, eagles, cormorants, and even brolgas. Observe crocodiles up close as they pass by the boat. Gunlom Falls: Soak into another fantastic natural pool. Probably the best investment if you are planning to spend a few days in the park. The pass is valid for 7 days but can be extended to 14 days for free. The cost of the pass is cheaper in the summer (November-May). Prices go from AU$25 for an adult, and AU$60 for a family (2 adults and 2 or more children) in low season, to AU$40 for an adult and AU$100 for a family in high season. Over 2,000 plants and animals grow and live in Kakadu National Park, including one-third of all Australian birds and about one-fifth of all mammals. Some of the most noteworthy Kakadu animals are the saltwater crocodiles, flatback turtles, frilled-neck lizards, jabirus, and Leichhardt’s Grasshoppers known as Aljurr. Large saltwater crocodiles are commonly seen in the Yellow Water and East Alligator River. Be careful when you hike by rivers as crocodiles can also walk on the ground and might try to grab you if you are too close to the water. Kakadu Camping: Each of the 6 major Kakadu areas has a campsite. Choose your Kakadu National Park Camping site depending on which part you want to explore. You can also decide to stay at a basic bush campground or soak in the pool of one of the commercial campsites. Camping spots are available on a first-come, first-served basis. By the Yellow Water, you can find the Cooinda Lodge Kakadu. One of the largest parks in Australia and one of the four Australia parks with double UNESCO recognition. Watch for crocodiles and wildlife in general, a national park is not a theme park and the animals can be dangerous. 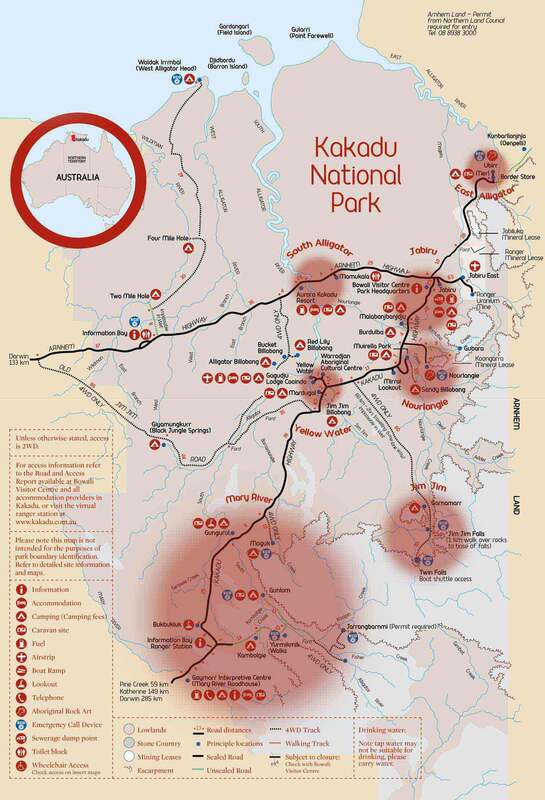 Some areas can only be accessed with a 4WD car, as you can see on this Kakadu National Park Map. If you are going on a self-drive to Kakadu, make sure to fill your tank regularly and don't miss the chance to do so at the few gas stations around the park: South Alligator, Jabiru, Cooinda, and Mary River. Some car rental companies might not allow you to take your rented 2WD on dirt roads. Check your rental policy for more details. Darwin is the capital city of the Northern Territory on the shores of the Timor Sea. The town is the hub for visiting different national parks like Kakadu National Park, Nitmiluk National Park aka Katherine Gorge, and Litchfield National Park. Like in Kakadu, Darwin has dry and wet periods, with roughly six seasons. Most of the people visit Darwin and the Northern Territory in the dry season from April to September. There are about three main areas in Darwin: the central CDB that has some of the major hotel chains, the quieter Parap with smaller boutique hotels, and Mindil Beach with resorts and more outdoor settings. Have you been to Kakadu National Park? What was your experience? Share with us your adventures in the amazing Australian wilderness. Stay tuned for more from our travel around the world! and YouTube for our latest videos. More travel news? Sign-up for our newsletter! This post contains affiliate links, which means we receive a percentage if you make a purchase using these links – at no cost to you. Our opinions are our own and are not impacted by these partnerships. ZeWanderingFrogs.com is a participant in the Amazon Services LLC Associates Program, an affiliate advertising program designed to provide a means for sites to earn advertising fees by advertising and linking to amazon.com, amazon.co.uk, amazon.ca. Amazon and the Amazon logo are trademarks of Amazon.com, Inc. or its affiliates.